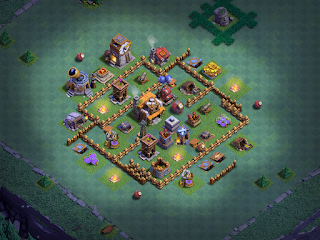 TH7 is a “catch-up” level; I’ll be maxing everything here except for walls. The first thing I do when I reach TH7 is add all new items and upgrade offensive structures. That said, one of the most important early buys is going to be the Dark Elixir Storage. Dark Elixir opens a whole new set of troops (Minions and Hog Riders, at this level) and, most importantly, the Barbarian King. The DE drill does not produce very much at this point *BUT*, as soon as you have the DE storage, you can start gathering DE through raids. Upgrade all remaining items to the same level as their counterparts (so, upgrade them to TH5/TH6 max levels). And, finally, upgrade walls so that all walls are at least level 6 (pink). Now, as for walls...this is a decision point. *I* normally go ahead and run 'em all up to level 7 (purple) but I've also just made the jump to TH8 and dealt with them there, along with TH8's 25 new walls. When I rush a base, I like upgrading all of my walls to level 7 before making the jump to TH8 because I intend to rush out of TH8 to TH9 very quickly and prefer to go to TH9 with all purple walls. It’s easy to do because I'm be raiding mostly other TH7 bases and they are susceptible to several types of attacks (barch, gibarch, bam, giant-healer). The upgrade finished a short while ago, so I bought the 50 new walls, archer tower, 2 cannons, 2 hidden tesla towers, giant bomb, 2 regular bombs, air defense, army camp, barracks, dark elixir storage, and dark elixir drill. All that the dark elixir storage and drill, as well as the teslas, will take 24 hours to be built; the AD will take 5 hours, which means that before I call it a night, I will be able to drop the mortar. Then, tomorrow, I can put down the dark barracks and farm 10K in DE to get the BK, while running a few other, small upgrades along the way. At the end of the day, I'll also have the lab down for its upgrade as well. TH7 requires 73M gold, 33M elixir, 105K DE, 224 days of builder time, and 57 days of lab time to fully max. I should have it mostly done by end of July latest, maybe a bit sooner if I get some decent freebie gems along the way. I believe we are up to day 23 now. Progress is slow and steady; as I've said before, I tend to max TH7 as the foundation for the rest of my game, so I'll be here a while. That said, I am only 3 days in, so progress may be slow but it's still pretty good. I'm focused on evening up everything right now, and upgrading key offensive structures. I have some 2-3 day upgrades going now, which means I am putting in maybe 15 minutes each day running a few raids and clearing collectors while I wait for a builder to free up. I haven't even dropped my Barbarian King yet. I'm using this time to put focus on my other games. I've run this TH so many times now, that I find I prefer to do some of the longer stuff early on to give myself a bit of a break. Up until today, the base was getting rides once a day or a little less; today I have been hit three times...I'm holding a lot of gold at the moment. There are one or two others updating this thread with their own rushed game progress, including SinOfDusk. (SoD is blogging most of his progress elsewhere; the link is in this thread.). We're all moving at different paces and you'll see some very different strategies in how each of us are playing our games. There are even more ways to do it, but hopefully this helps answer some questions around rushing strategies. I anticipate my next update to be one week out (about day 30). By then, I will have everything leveled out, including collectors and walls, have the BK dropped, and be working on various upgrades. Here's the latest; "see" you in a week. A quick interim update. It's day 28 and I have everything bought, evened up with previous TH levels, the BK has been dropped, and all walls are level 6. I've completed the upgrade of both the lab and spell factory, and all army camps are level 6. Mortars are upgrading now, wizard towers will follow shortly. Most of these defenses have two levels to go through, so that will be the focus of the next couple of weeks. I am still farming mostly in Silver, occasionally popping up into Gold. My army comp is 8 Giants, 8 wallbreakers, and the remainder an equal split of barbarians/archers/goblins. I farm only what is needed for upgrades to keep builders and Lab busy, and I am still only playing 15 or 20 minutes in any given day until I have multiple builders come open, at which point I will commonly boost barracks and raid for an hour. I just exhausted the last of my gems, so it will be a bit until I gather enough to do another boosted raiding session. As I've mentioned before, this is a very strategic kind of rushing, aimed at achieving a quick but solid entry to TH9 with a reasonable degree of time investment. The game really begins at TH7; this is where one can effectively battle in clan wars and where raiding large quantities of resources takes off. Each TH thereafter becomes just a little more intense, offering up several new troops, defenses, and strategies. TH9 is probably the most complete TH in the game - it is well balanced, VERY playable long term, and is commonly played for as much as a year or more. (TH11 has found its way there as well of late.) I spent almost 9 months at TH9 on my main game and I have two other games that have 1 and 5 months there now. This latest game will max TH7 in a few weeks, jump to TH8 for another two weeks to max new items and upgrade key farming troops, then it will be at TH9 as well, taking just over 2 1/2 months to get there. As I said...a significant task and one that will require several months, even if you decide to rush to TH10 or TH11. It's been about 5 days since my last update; day 33 is here. I continue upgrading defenses, troops, and now the Barbarian King is in the mix. I'm working my way up the list of upgrades. Most days are 10-15 minute days; about once every four or five days, I'll boost barracks for an hour if I have the gems. I goofed and completely lost a day; life intrudes...I jump started things again tonight, though. I have two days until one builder frees up, another day beyond that for the four others who are busily upgrading my archer towers to level 8 (TH7 max). That means the next couple of days will really just be clearing collectors. I have enough DE stored up for the next BK upgrade and although it will be raided, it won't take but one or two quick raids to keep it ready for when that first builder frees up again. The same goes for elixir; the lab comes open in a bit over a day and I'll be upgrading wizards next, most likely. This is a strategic rush; I am carefully planning every step of the way to provide the most efficient route to TH11. That means the least amount of time getting there. I am not warring this time around, although I certainly could (and have done so in the past with my rushed bases). Efficient, strategic rushing maximizes both resources and lab/upgrade schedules. Unlike maxing, there is essentially zero downtime in such a scenario (unless I get busy and then that's just on me). My builders and lab are going nearly constantly and, up to this point, I've actually spent very little overall time on the game (typically just a couple hours each week). I chose TH7 as a brief layover point to max the game out and provide a solid base for the next phase of rushing which will take me rapidly to TH9, essentially bypassing TH8. This is when my time investment will start to go up significantly as I will be forced to spend much more time raiding for resources to complete more expensive builds and upgrades.